Dr. Warwick F. Vincent is a professor in the Department of Biology at Université Laval since 1990, where he holds the Canada Research Chair in Aquatic Ecosystem Studies since 2002. He was director of the interuniversity centre of excellence for research and training Centre d'Études Nordiques (CEN: Centre for Northern Studies) from 2008 to 2012, and is currently scientific director of CEN. He is internationally known for his work on aquatic ecosystems (lakes, rivers and coastal seas), mostly at high latitudes and with emphasis on environmental controls on communities and processes at the base of aquatic food webs. 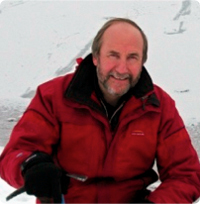 Dr. Vincent has published over 280 scientific papers, and 14 edited volumes including Polar Lakes and Rivers: Limnology of Arctic and Antarctic Aquatic Ecosystems published by Oxford University Press (2008). He has chaired or been a member of many scientific and advisory committees in Canada, USA, New Zealand, Australia, Japan and Europe, including for Antarctic and Arctic research, and he presently serves on the editorial boards of Aquatic Biology, Freshwater Reviews and Limnology. Dr. Vincent has received several awards and distinctions for research and education, including the Rigler Award in limnology (1992), the SUMMA-research prize from the Faculty of Sciences and Engineering at Université Laval (2008), the Miroslaw Romanowski Medal for environmental research from the Royal Society of Canada (2008) and the Ramòn Margalef Award for education in limnology and oceanography (ASLO). He is a fellow of the Royal Society of Canada, honorary fellow of the Royal Society of New Zealand (2002) and was named Lauréat de Québec by Radio-Canada and Le Soleil in 2008.